Answer: Not that much actually. In his book, The End of Poverty , Jeffrey Sachs made some careful estimates as to what it would cost to end extreme poverty in the world in about twenty years. If you are unfamiliar with what the term ‘extreme poverty’ means, check out our piece on defining poverty. 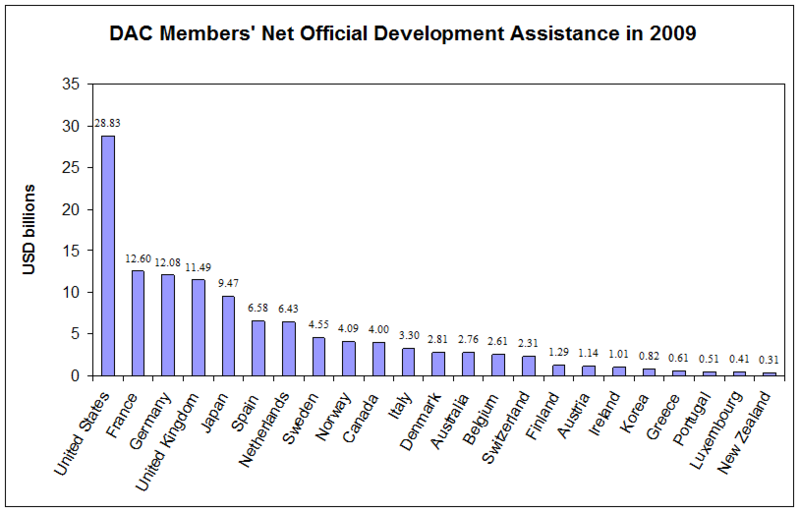 In fact, this cost is 0.7% of the total income of the 30 countries who comprised the Organisation for Economic Co-operation and Development (OECD) in 2005 when Sachs wrote The End of Poverty. For his calculations, he used the 2002 values for their collective wealth. This is relevant because while there have been some rough economic times since 2002, OECD total income is still somewhat higher now than it was then. This level of aid has in fact already been promised by the developed nations through the Monterrey Consensus. This consensus guarantees 0.7% of gross national product (GNP) as official development assistance (ODA)1 . However, fiscal commitments have lagged far behind the agreement. 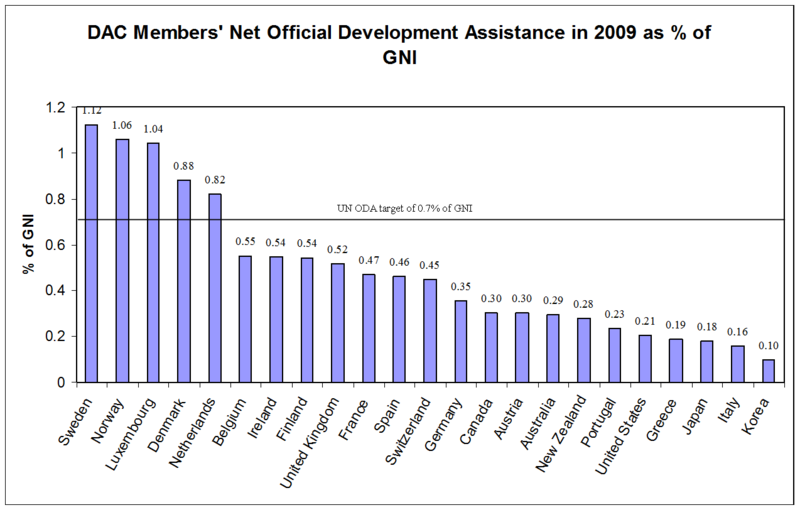 For example, the US only gives 0.18% of GNP as ODA, a much lower value that the Scandinavian countries. In order for poverty to be ended in the next few decades, the US needs to ramp up to about $75 billion per year in ODA. This would be their contribution if they deliver 0.7% as promised. The United States is spectacularly wealthy. With a GNP in 2009 of about $14 trillion, the US is a huge chunk of the total GNP of the OECD, which is about $40 trillion2 . The sheer size of the US economy means that even though they only give 0.18% of their GNP as ODA, they still give the most total money of any nation on the planet. The military budget in the USA is about $680 billion per year3 . A large amount of other funding is directly connected to military spending in the states, bringing the total closer to $1 trillion per year4 .Even if we assume the lesser of these numbers, annual defense spending in the US is about four times as much money as is needed to begin rapidly ending extreme poverty in the entire world. If some of the US military’s monstrous budget could be channelled towards humanitarian goals, then extreme poverty in our world could quickly become a thing of the past. In 2011, the US Gov’t will spend about $3.4 trillion. Ending world poverty would require about 5.1% of the current US federal budget. We certainly acknowledge that the US government is facing problems with their budget recently. To put it bluntly however, their problems are primarily political and ideological rather than monetary. The US economy is gigantic and currently has very low tax levels for many of the richest segments, including corporations and extremely wealthy people. If corporations and the extremely wealthy are made to cough up their fair share, the US will be well on its way to fixing their budget issues. Even just repealing the Bush-era tax cut on the extremely wealthy people would pay for about 40% of what is needed to end extreme poverty in the world. Repealing the entirety of the Bush tax cuts would raise about $370 billion per year, or about twice as much money as would be needed to end world poverty. It is our hope that the people of the United States take back control of their country from the corporations and the ultra-rich. We then believe that the natural humanitarian inclinations of the American citizenry will then be more free to help the world achieve prosperity. The United States could become a humanitarian superpower by helping to build the world of tomorrow and sowing deep international goodwill in the process. It is difficult to find where the truth is if you read Jeffrey Sach’s book ‘The End of Poverty’ then follow it up with Naomi Klein’s ‘Shock Doctrine’. Jeffrey Sachs’ argues for a market based approach to pulling people out of poverty. As I recall he advises bringing down inflation and allowing inward foreign direct investment. Naomi Klein, in her critique of the Washington Consensus, which Sach’s broadly aligns himself with, argues that this results in economic imperialism. She argues that much of the Asian crash was in fact a western bank and financial group plan to bring into effect a fire sale in Asia, and impose privatisation of government services while the local population is reeling and unable to resist anti democratic reforms. The architect of the Washington Consensus is on record as saying if free market reforms can only be pushed through in states of crisis then crises should be manufactured. My view is that inward direct investment can do a great deal of good. However, it should be tempered with strong domestic controls of foreign currency exchange. In the Asian crisis, Malaysia closed the currency markets in the country and prevented foreign investment from leaving. As a result they were for the most spared the massive collapse into poverty which occurred in Indonesia next door. Additionally, Sachs is working on projects where he brings green revolution technology to African villages. This is wrong headed. Industrial farming methods are not well suited to developing nations, where the bulk of the population lives on the land. Additionally, the massive loss of topsoil and soil fertility which accompanies industrial farming, the effects of which can only be ameliorated by ever greater applications of inorganic fertilizer is widely recognized in the West. One therefore has to ask the question of why should we force poor people to repeat our mistakes. To end poverty, I would advise reading books such as Natural Capitalism, Jeavon’s Biointensive Agriculture and the ZERI website. I would also advise following the Permaculture work in Jordan. I believe these models, community based, as opposed to free market based, offer more hope for the world’s poor. I have an idea how to stop poverty. How about STOP HAVING CHILDREN if you can’t afford them. As far as I know the story with the stork has been proven inaccurate. Having children is a choice. Most of homeless people are families with children. Does anybody think that maybe the reason they are homeless is because they chose to have children when they couldn’t afford them? And don’t tell me they don’t have enough money to buy condoms, but they believe they will have enough money to raise one, two, three or 7 children. I have no compassion for these people. I feel sorry for the children, they are just unfortunate, but their parents? They made a choice and I really don’t see why should I have to pay for their mistakes. This is a great note and comments that followed were also well informed. I agree that a market based solution is the answer to the end of poverty but I do not agree that is needs to come in the traditional forms. This requires a change in our social programming coupled with modern technology. Creation of a new type of market would enable people to achieve a level of opportunity that empowers them to build their own way out of poverty. The details are complex but creating a marketplace and generates a return on investment for charitable activities and uses resources and people closest to the problem to create the solutions is the answer. This marketplace consumes poverty to the point where the word itself will have to be re-defined. Pingback: The Hunni Blog ELA 20 » Blog Archive » Budgeting. The USA puts over some TRILLION $ into weapons and war. A small part of that, some 0.5 % could solve world hunger and poverty. There is always a way if there is a will. But the rich and the filthy rich don´t want to share, and there lies the problem. But they will all be born again – right in to the starving children on this planet, John 3:3,7,13 !!! For their Karma will catch up with them. Poverty will never end until we teach people to be independent. Throwing money on a problem never solves anything. People need to learn to stop taking things for granted. They need to work with the poor people and develop a future plan. Also government housing is too cheap. These people get nice little places, small cost, and get soooo use to it. Take it for granted and depend on it. Who wants to work after having an experience like that? That’s what happen, That’s one of the reason why we have more poor people. Ship those people to a real poverty country and lets see if it will change their meaning of “I’m poor and unable”. I bet maybe it will inspire them to do more. There are opportunities here dont abuse it and be unthankful. Poor people in america complain how “Hard” it is.. But they dont anything about a hard life. I’ll be dam’d to give anymore money.. Not following to be stucked in debt. People think that rich people don’t give to charity and it really bugs me. Total giving to charitable organizations was $316.23 billion in 2012 (about 2% of GDP). This is an increase of 3.5% from 2011. There is also not one specific solution to poverty and if someone tells you this they don’t know what they are talking about. You can just keep giving money to people you need to get to the core of the issue. Alcohol, drugs, metal disorders and no education are just some of the issues. People also think it is easy for rich people to just right a check to help the poor. That doesn’t solve the core issue and prolongs the problem. Also most of the wealth held by the mega wealth and rich is on paper and back by securities. This means it is liquid wealth and can’t just be given away easily. By creating technologies and growing companies it creates jobs. This is the only way to reverse poverty. The problem with “solving world poverty” goes beyond the simplistic statement – it is one of definition. For example, ‘simple’ financial poverty today will have very different metrics when compared to 100 years ago, and will vary geographically – e.g. “teach a man to fish…”, not much good in many landlocked arid counties. Ensuring that no one unintentionally dies of starvation, or contracting an illness or other medical condition will be easier to measure than ‘poverty’ reduction. And of course there are the many (google them) reports that ‘poor’ people with less possessions are happier that those of us with many possessions that we e.g. need to defend from potential pillage, theft and destruction. I am confused as to how to really attack the issue – socialism / communism doesn’t appear to work, and neither does capitalism (are there less starving Africans now that the Wall has come down?). Probably the adoption of the ‘yours, mine, theirs, all property is theft’ maxim might allow an appropriate level of global redistribution to solve the challenge. But are you willing to give up ‘mine and yours’ in order to solve it – I think not! Are you willing to give up some of ‘mine and yours’ in order to solve it – I’d hope and wish so, but I think that most of us would not give up enough! As much as people want to spin it, whether it’s to protect their conscience or their ego that’s identified with their nationality or whatever, no matter how many reasons you come up with to prove that solving poverty “wouldn’t be that easy because x-y-z………..” or how you show that you DO in fact give to charity…..blah blah blah………The basic fact is that 1 trillion dollars spent on defense is sick. The entire notion that it is more important to carry armament to destroy the planet twenty times over in order to defend the ideals, policies, business, ego of this country’s elite against another country’s elite, at the expense of the remaining 99% of these nations is demented. Period. In fact, the idea of drawing imaginary lines on a map and calling it a separate nation which needs to be defended is preposterous. This is not 200 BC. There is no Attila the Hun coming. In order to validate this they create a “war on terror” …….but I’m not even getting into that. You are certainly right to put military spending and militgary thinking at top of list as obstacles to eliminate world poverty. Many people seem to think wars are inevitable – nothing will ever stop them happening. This is not the case. Wars happen because each nation is allowed to have its own army. When nations fall out, it does not take long before one lot starts killing the other. These days the killing is not just of rival soldiers but is quite random, women and children, the sick and the elderly are all fair game for the bombs and shells. In Syria, to take but one example, it may well be your own government which becomes the main killer. This is an appalling situation but at present there is nobody able to call a halt. It need not be like this. If the UN was given the legal right to take command of all the world’s armies it could then deploy them strictly for peacekeeping purposes, for rooting out illegally held weapons and for preventing the researching, manufacturing and marketing of new weapons. The UN could set up structures for resolving disputes impartially in accordance with the Charter of Human Rights. Apple apparently has this much spare cash. Time to make amends for third world exploitation? Pingback: $165 Billion: Food Wasted In America Can Actually End Global Poverty - Statspotting! if ever i was in a position to change the world and help nations build a positive future i would do it in a heartbeat poverty can be stopped and i think its simply selfish and cruel for people not to help i don’t have money to give but i would do anything with in my power to insure children mothers and fathers had food, water, education, hopes dreams and goals i can only imagine what goes through their thoughts and none of its good, fear riddles them uncertain if their babies will survive through the night famine controls the out come of their lives this is what we are all letting it happen. it makes me sick knowing all i can do for them is hope the people in positions to help actually do something about it its sad and honestly i believe its inhumane to let other people die of starvation or disease knowing damn well something can be done about it. Pingback: The cost of war, far exceeds the cost of peace! | Shahzad Sheikh: Word Up! create an online project where the site gets donations from the richest people, companies on the planet. end poverty world-wide. People do bad things when they are desperate, I wish they didn’t have to. I’m a self though web developer, web designer, I can build whatever I need when it comes to websites etc. If anyone ever needs someone to help out, work on anything related to this topic, please let me know. I can’t save the world by myself, but we can try together. continents creates a direct as well as meaningful partnership between people in these very different regions of the world. where kids dwell and receive lessons in academic and helpful life skills .